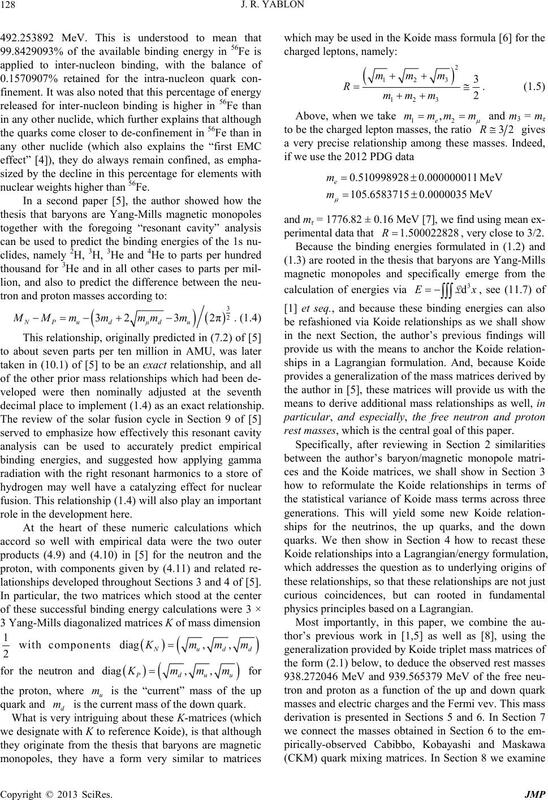 Koide relationships for the neutrinos, the up quarks, and the down quarks. nuclear weights higher than 56Fe. decimal place to implement (1.4) as an exact relationship. role in the development here. lationships developed throughout Sections 3 and 4 of . 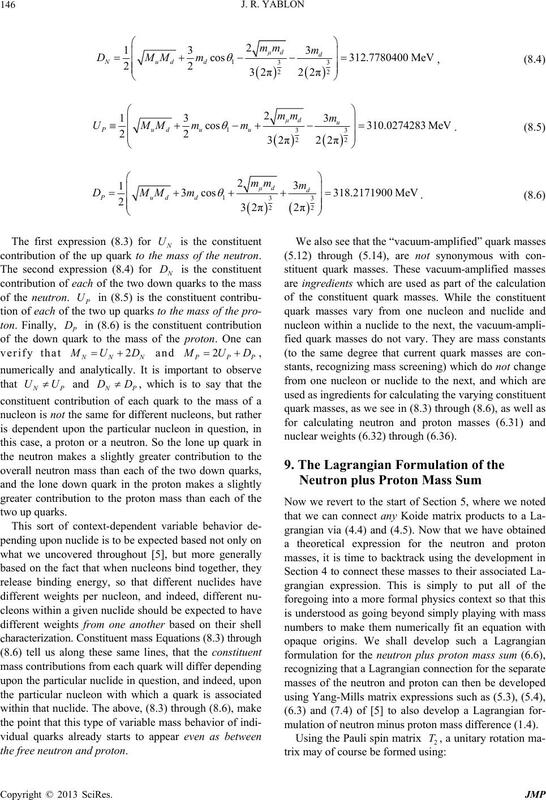 quark and is the current mass of the down quark. , very close to 3/2. 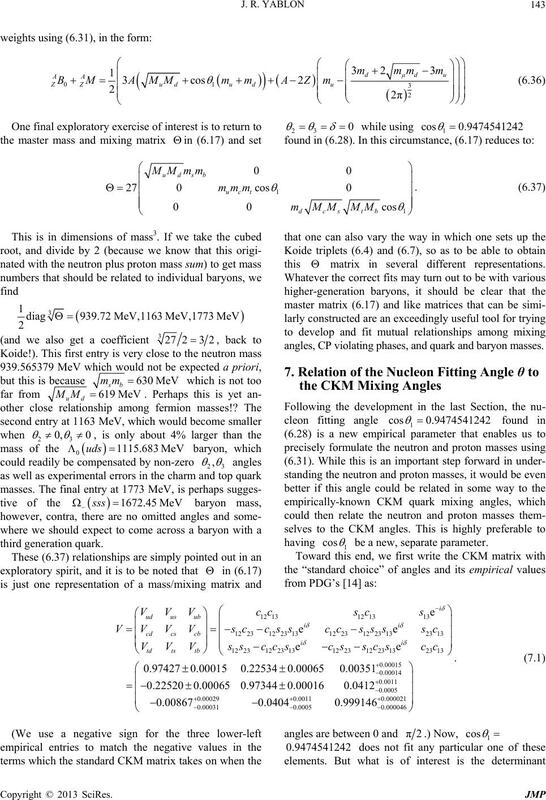 rest masses, which is the central goal of this paper. 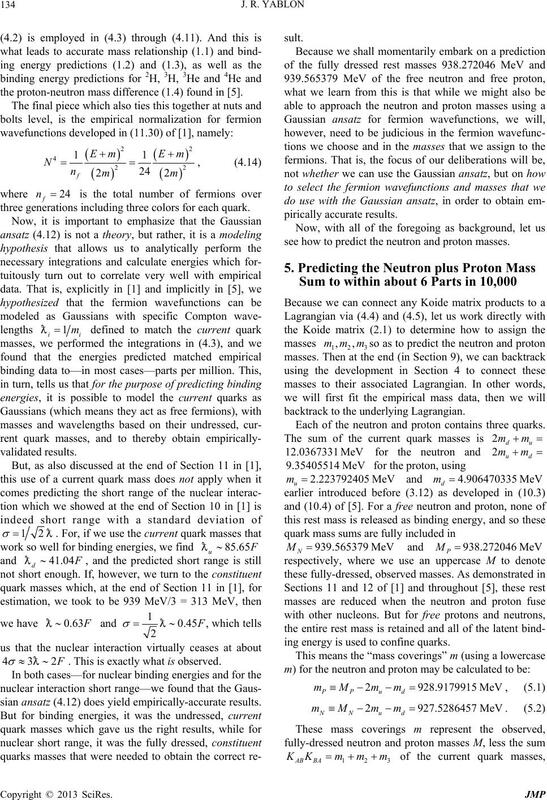 physics principles based on a Lagrangian. 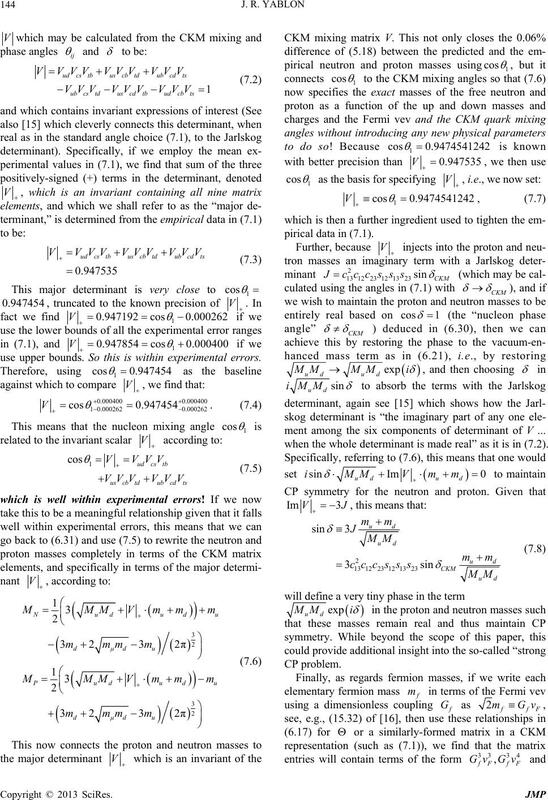 fundamental physics principles based on a Lagrangian. masses to be explored here. variance of the Koide terms across the three generations. the edges of the experimental ranges, and it is not. which naturally absorbs the 3 from the factor of 3/2. sponds with C = 1 in (3.7). , as has long been known. 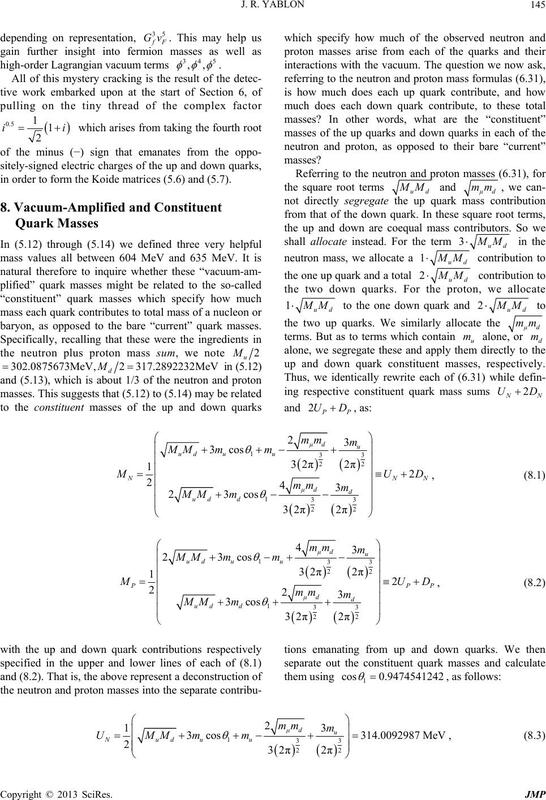 up to the down quarks. by four or five orders of magnitude. 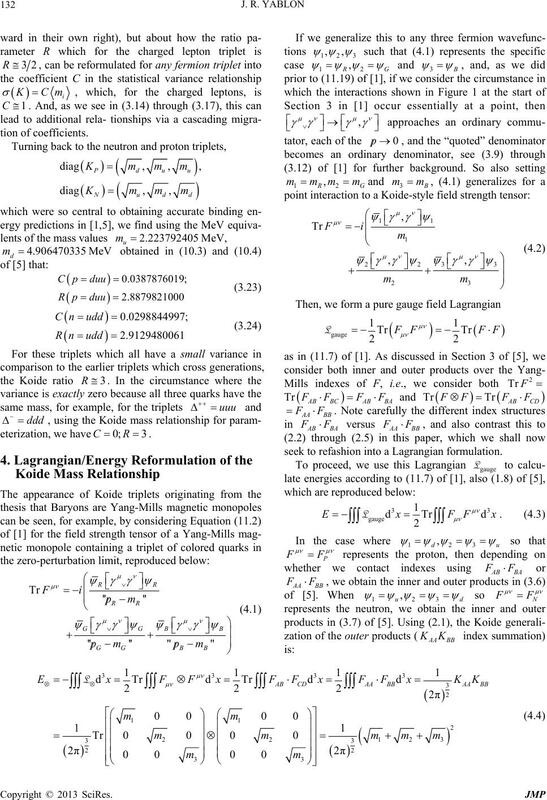 seek to refashion into a Lagrangian formulation.  , see  following (11.18). 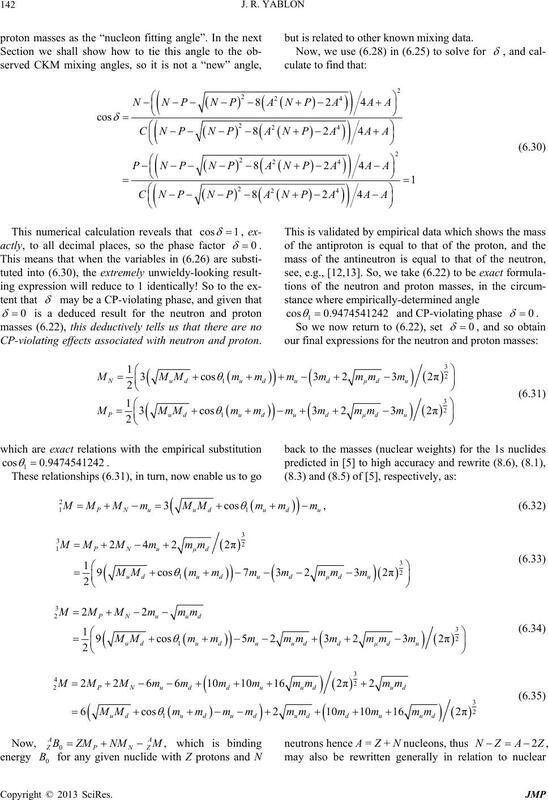 the proton-neutron mass difference (1.4) found in . three generations including three colors for each quark.
. This is exactly what is observed. sian ansatz (4.12) does yield empirically-accurate results. 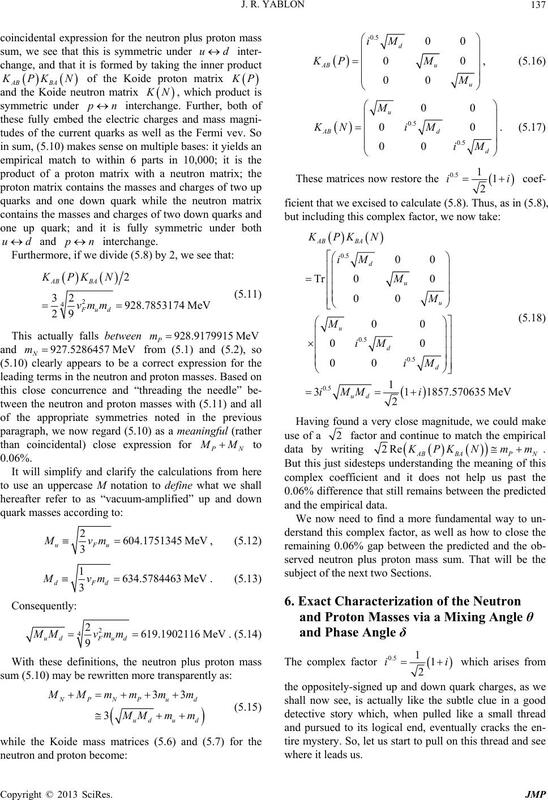 see how to predict the neutron and proton masses. 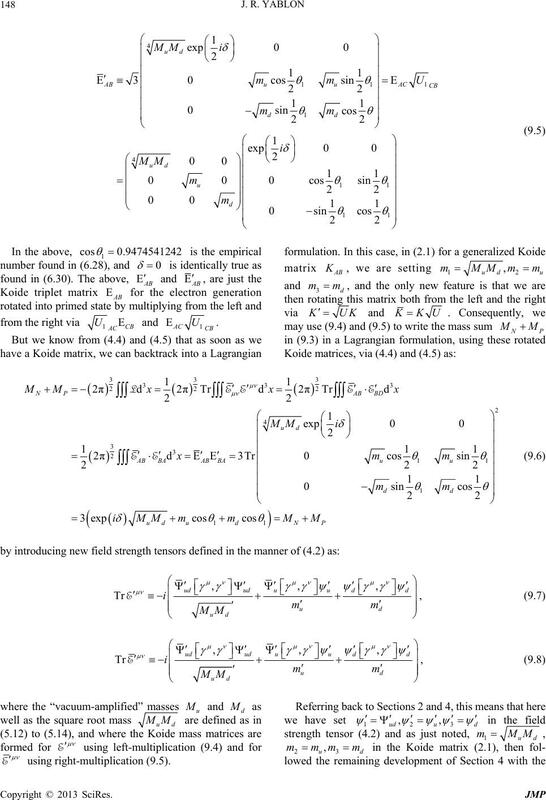 backtrack to the underlying Lagrangian. Each of the neutron and proton contains three quarks. 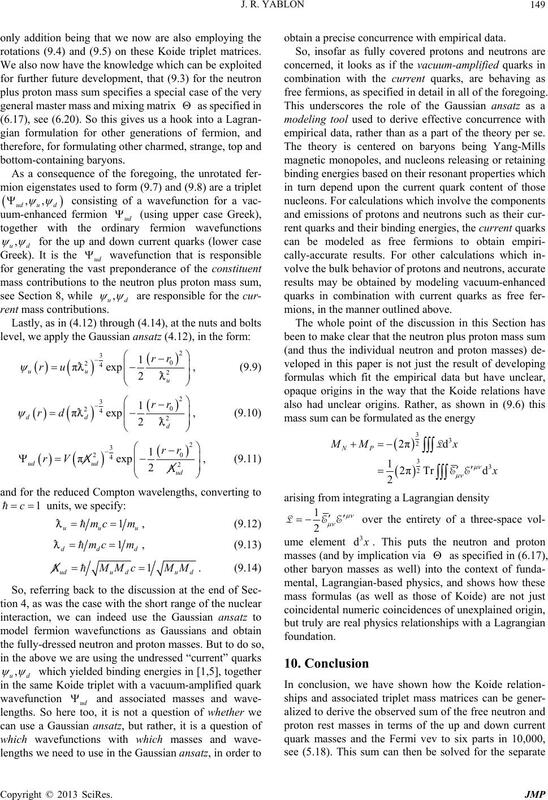 ing energy is used to confine quarks.
. These sums are what we now seek to predict. target (5.3). As we shall, it can be so used! closer to the target mass of in (5.3). used to generate the sum of their masses. we see that we have hit the target to within about 0.06%! sum to 6 parts in 10,000! subject of the next two Sections. 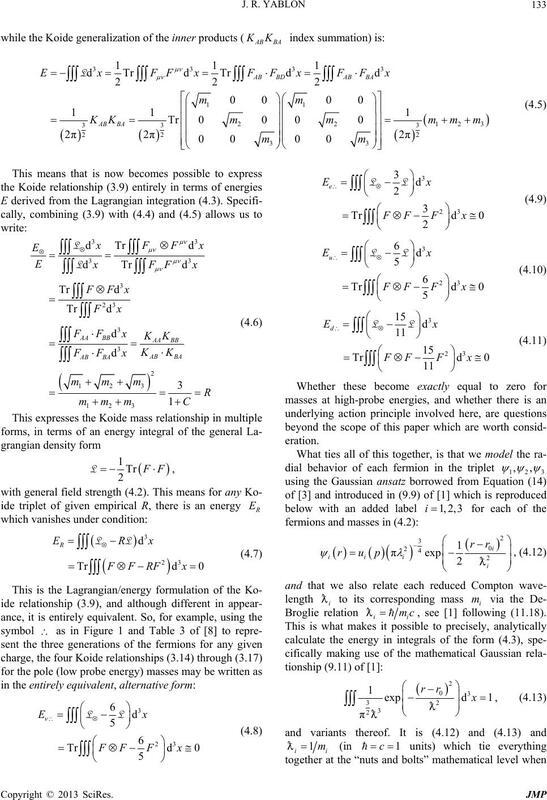 Equation (6.6) at the bottom of the page. 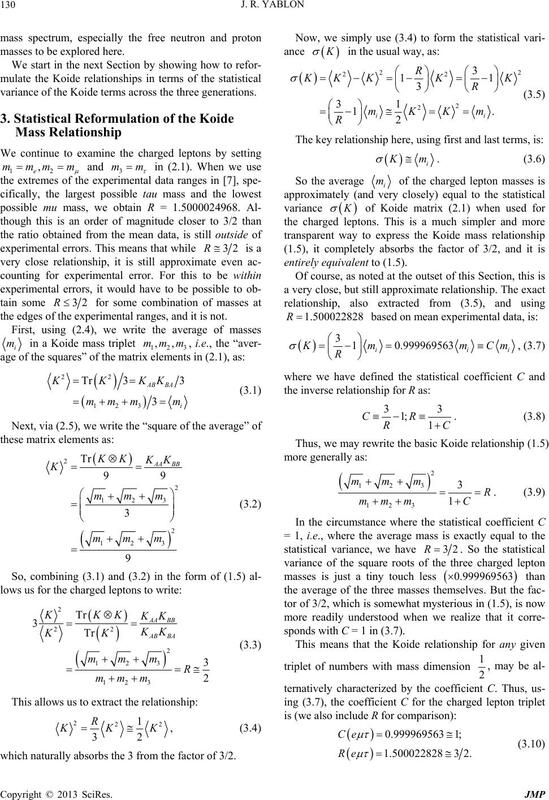 we formed Koide matrices to represent masses. he nature of this detective mystery! but is related to other known mixing data. CP-violating effects associatn and proton. 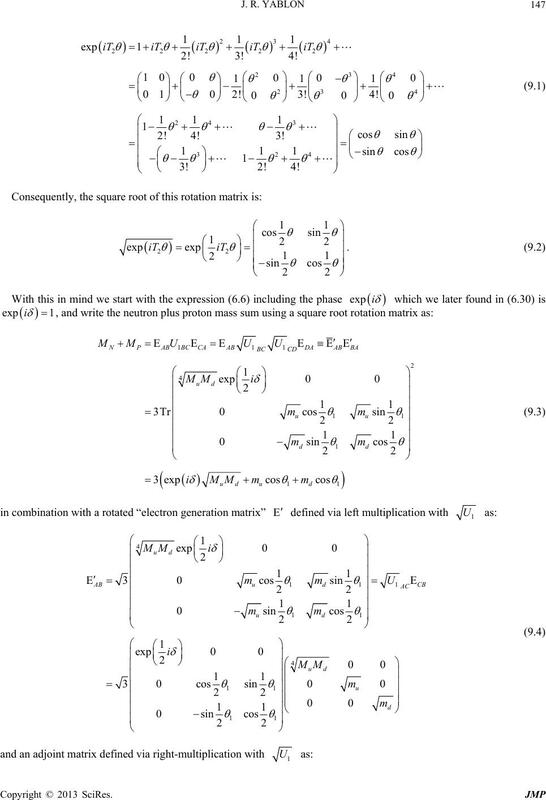 matrix in several different representations. be a new, separate parameter. e upper bounds. So this is within experimental errors. 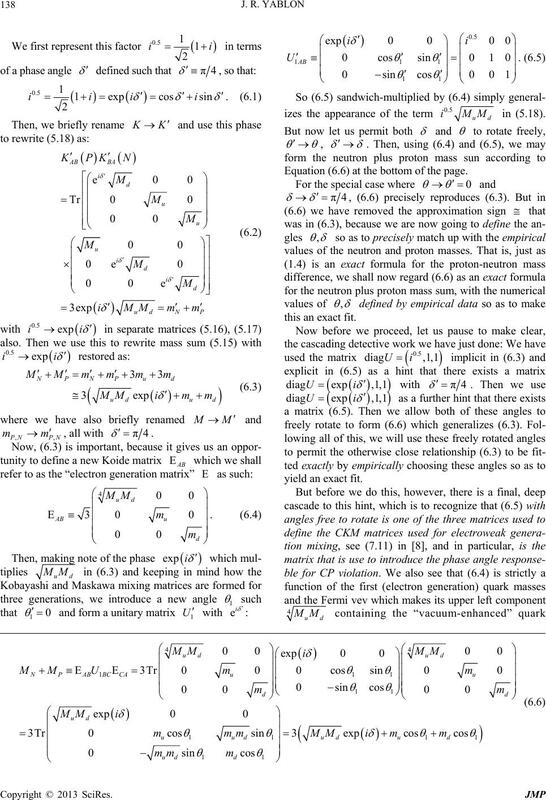 when the whole determinant is made real” as it is in (7.2). 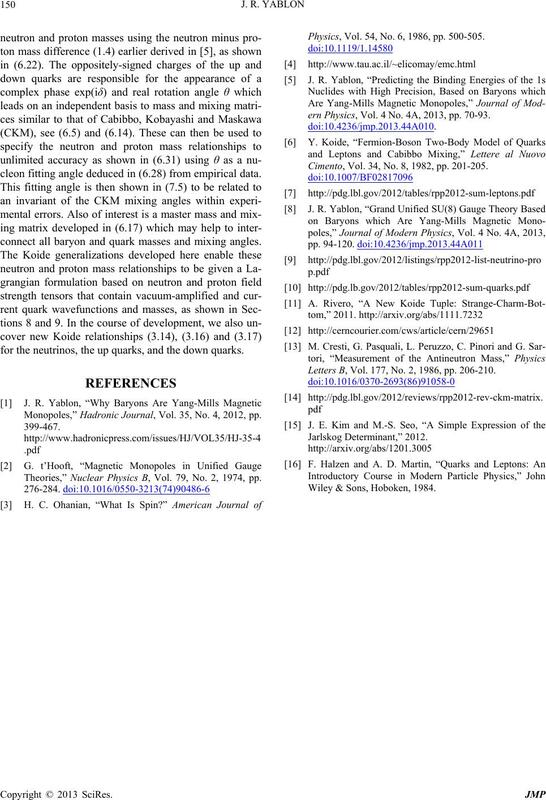 up and down quark constituent masses, respectively. 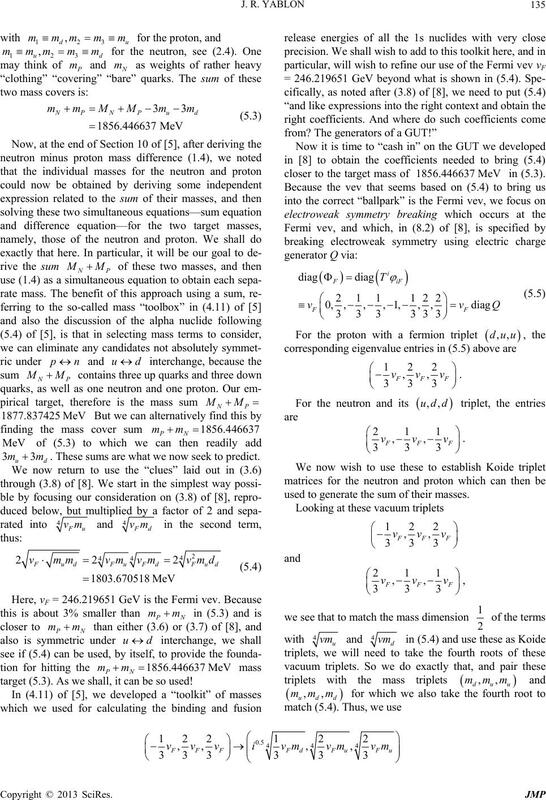 baryon, as opposed to the bare “current” quark masses. 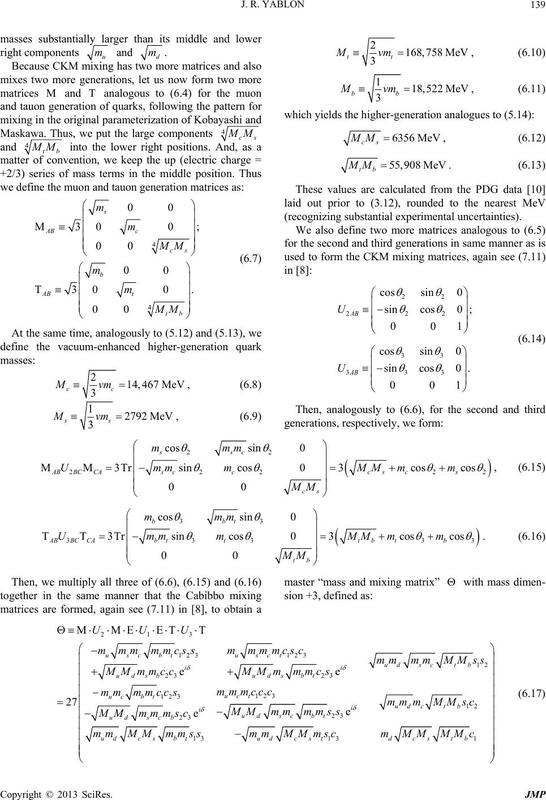 contribution of the uark to the mass of the neutron. the free neutron and proton. nuclear weights (6.32) through (6.36). 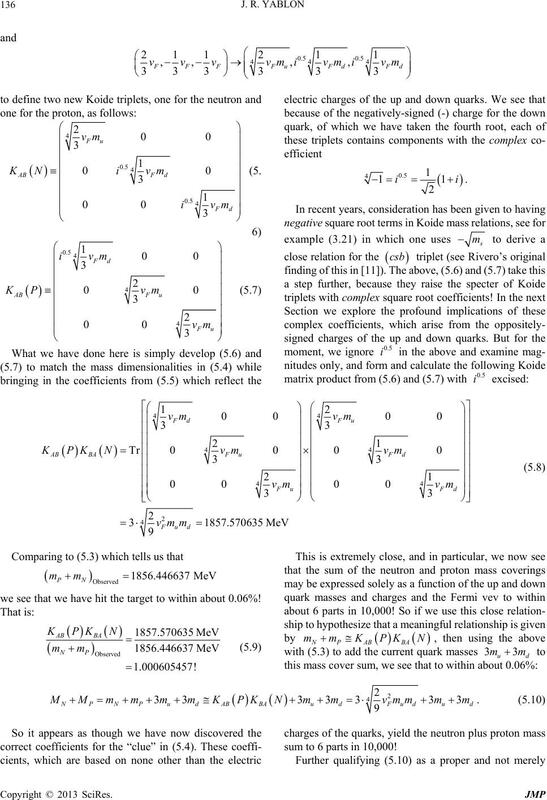 mulation of neutron minus proton mass difference (1.4). 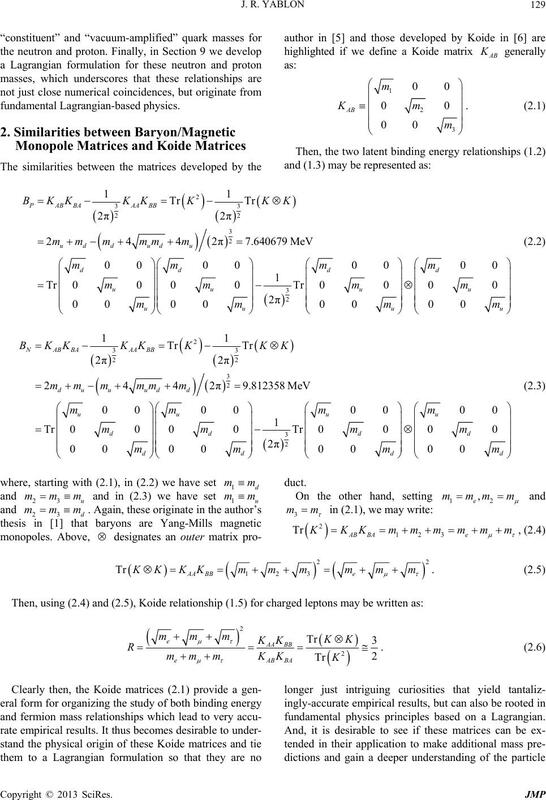 rotations (9.4) and (9.5) on these Koide triplet matrices. obtain a precise concurrence with empirical data. 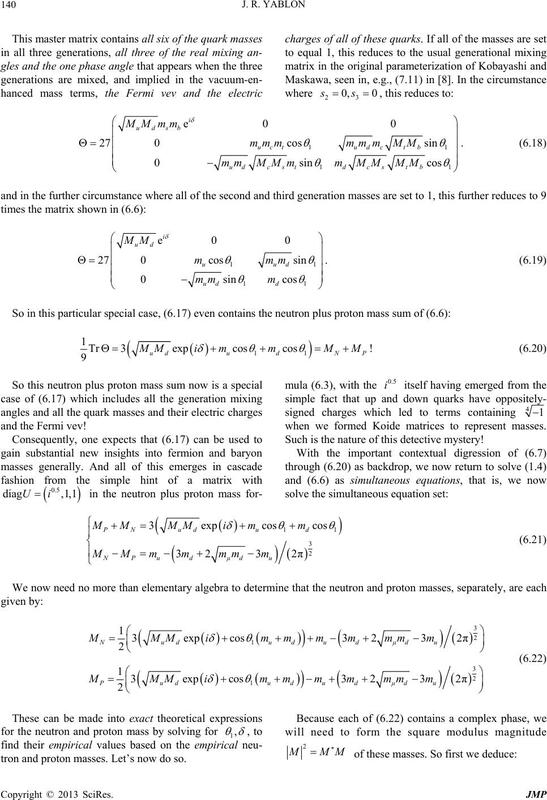 free fermions, as specified in detail in all of the foregoing. empirical data, rather than as a part of the theory per se. mions, in the manner outlined above. 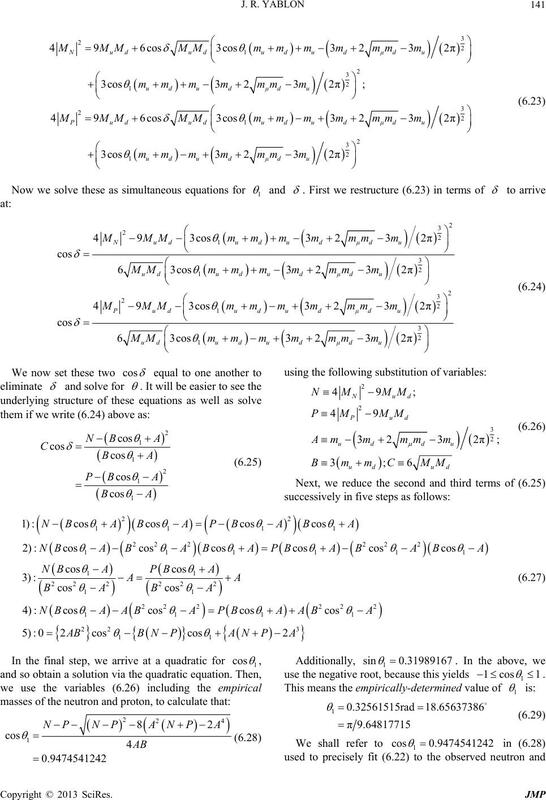 cleon fitting angle deduced in (6.28) from empirical data. 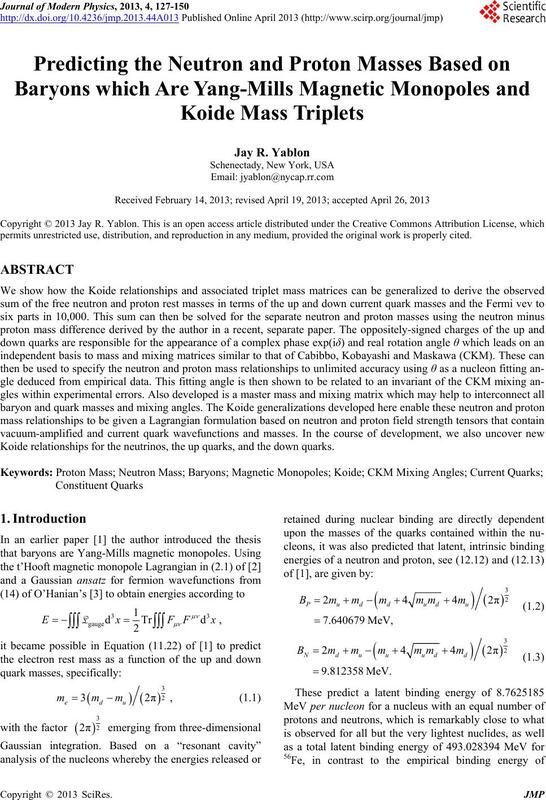 connect all baryon and q masses and mixing angles. r the neutrinos, the up quarks, and the down quarks. 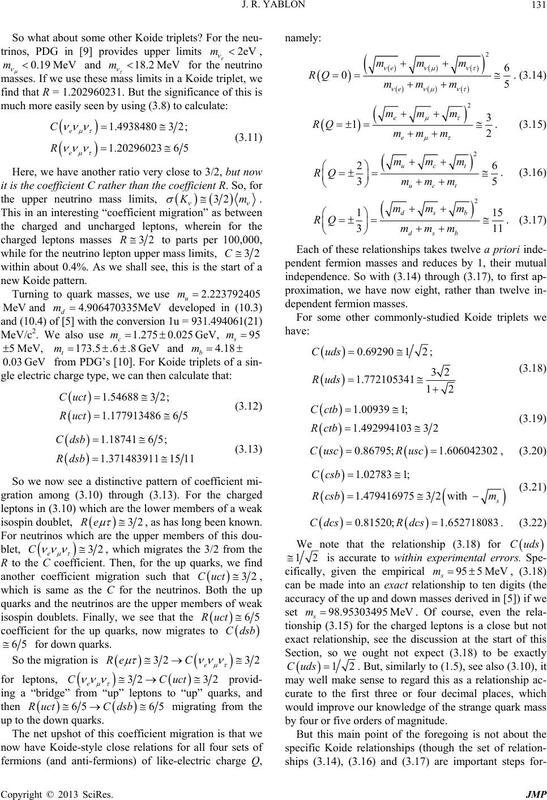 ern Physics, Vol. 4 No. 4A, 2013, pp. 70-93. Cimento, Vol. 34, No. 8, 1982, pp. 201-205.
Letters B, Vol. 177, No. 2, 1986, pp. 206-210.